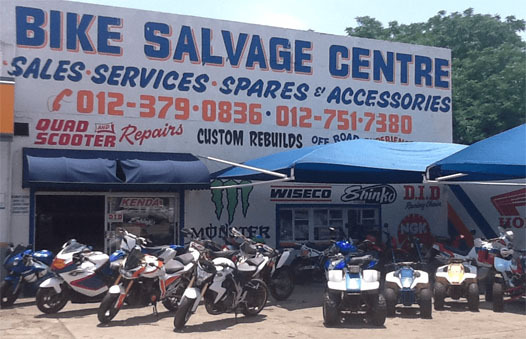 Welcome to Bike Salvage Center online, the finest motorcycle store in South Africa. We are located in PTA Gardens, which is in the North West of Pretoria, near the PPC Factory. We have been around for over 17 years and boast a HUGE range of superbikes, cruisers, quads, off-road and kids motorcycles as well as accessories, parts, and used bikes. Use this site to find out all the information that you need and then come and visit our shop for friendly service and a great deal or click here for our available bikes to get your bike bits. Please come back regularly for the latest specials and news. WE BUY ALL ACCIDENT DAMAGED MOTORCYCLES DEAD OR ALIVE!! !